When five juveniles used an SUV as a battering ram to slam through the front window and metal security gate of the Rocklin Armory gun shop on an early July morning, Walter Ford’s ultra-high-definition security cameras captured the entire incident in near perfect clarity. The burglars stream into the store and begin searching for the cache of weapons they expect to find. One disappears from view, then reappears carrying a rifle and runs out of the store. The other four, though, can’t find any weapons to steal. They quickly check the shelves, find nothing and run back through the smashed entrance. The entire incident takes less than two minutes. 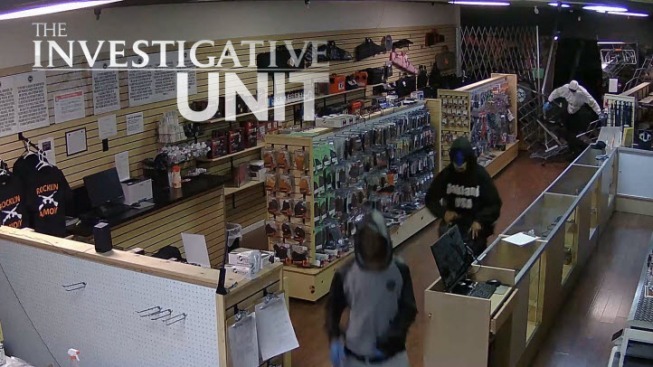 The brazen burglary was one of five Sacramento-area gun store thefts in less than three months this year. In all, more than 200 guns were stolen, but only one came from the Rocklin Armory. That’s because Ford, one of the store’s two owners, takes precautions. Guns are high-value items, especially to criminals, and Ford knows he’s a target. Each night before closing, Ford locks up every gun in a safe. The one rifle he lost was left out because it was being worked on for a customer. But not every gun store takes those steps. Just two months earlier, a nearby gun store lost more than 100 guns in a single burglary. None of it was captured by surveillance cameras. The next morning, the U.S. Bureau of Alcohol, Tobacco, Firearms and Explosives was on the case. Graham Barlow, ATF special agent in charge of the agency’s Sacramento field office, said gun shops are increasingly becoming targets of criminals. For some gangs, gun theft has even become a specialty. The number of guns stolen from gun shops in California nearly doubled between 2013 and 2015. Last year, more than 400 guns were reported stolen from California gun stores, according to ATF data. And those are just a fraction of all guns stolen in California. According to data from the California Department of Justice Bureau of Firearms, more than 70,000 guns were reported lost or stolen by gun owners in the past five years. A joint investigation by NBC stations across California found at least 4,000 of those lost or stolen guns were later seized by police in connection to crimes. The national numbers are even more troubling. In the past 10 years, more than 2 million guns have been reported stolen in the United States, according to data from the Federal Bureau of Investigation. Barlow appreciates firearms and the right to own them, but said people need to do a better job of keeping guns out of the hands of thieves. “I keep my firearms in a safe, a gun safe, and I’m the only person that has the combination to it,” Barlow said. But stealing guns in California, and particularly the Bay Area, is getting harder. Following the high-profile killing of Kate Steinle on Pier 14 with a gun stolen from a Bureau of Land Management ranger and an NBC Bay Area investigation that found local and federal law enforcement agencies had lost more than 800 guns in recent years, San Francisco passed an ordinance prohibiting any person from leaving a gun in an unattended vehicle unless stored in a lock box or locked in the trunk. Oakland, which experienced its own tragedy when muralist Antonio Ramos was killed with a gun stolen from an Immigration and Customs Enforcement agent, soon followed with some of the most aggressive gun safety legislation in the country. The Oakland ordinance bans anyone from storing a gun in their own home unless it’s stored in a locked container or disabled with a trigger lock. And less than two months ago, Gov. Jerry Brown signed a bill authored by state Sen. Jerry Hill prohibiting law enforcement officers from leaving an unsecured gun in a vehicle. Like San Francisco’s ordinance, it would require law enforcement officers to keep firearms stored in a lock box or in the trunk. Passing any sort of gun control legislation at the federal level has largely been an exercise in futility for some time, but Bay Area Congressman Mark DeSaulnier is now attempting to do just that. A bill he proposed in September, similar to Hill’s California legislation, would require all federal law enforcement officers to safely store service weapons when not in their possession. After Steinle’s death and NBC Bay Area’s investigation, DeSaulnier said it’s time to act. DeSaulnier said he’s not deterred by what will most likely be an uphill battle.